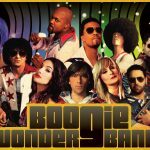 After 3000 shows around the world the Boogie Wonder Band has become the most celebrated DISCO band of our generation. Over the years, BWB has had the privilege to share the stage with Kool & The Gang, Village People, Rick James, War, CHIC, KC & the Sunshine Band, Gloria Gaynor, Maxine Nightingale, The Trammps, Paul Shaffer, Pointer Sister, Styx, Foreigner and the who’s who of funk and disco… With 10 world class singers and musicians, the band is as versatile as can be. For this reason they have been able to welcome special guests onstage, perform with string quartets & symphonic orchestras or to build a special number for a TV show or gala, such as the SOCAN 25th anniversary party. BWB transports their audience back to the 70’s groove and glamour with their flamboyant costumes, tight choreographies, and incredible light show. It all adds to the authenticity of their performance and success of the band. Keeping disco and funk alive!